The #WalkAway Town Hall advocated for LGBTQ people to abandon the Democratic Party and embrace conservatism. 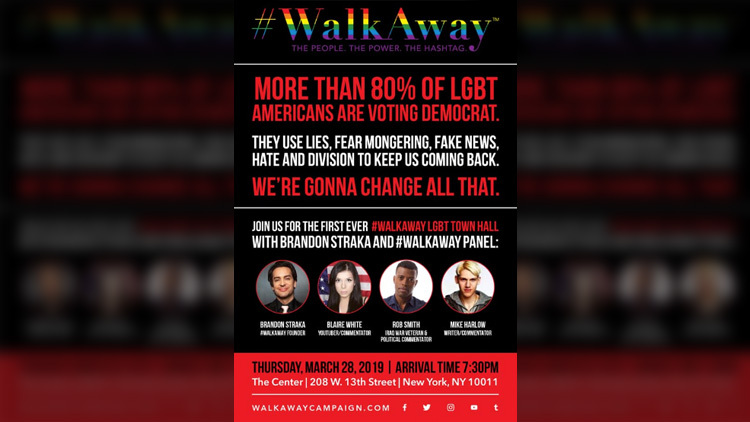 Following an online outcry and protest threats, New York City’s Lesbian, Gay, Bisexual & Transgender Community Center canceled an event — billed as the #WalkAway LGBT Town Hall — that was to feature controversial queer conservatives and encourage LGBTQ people to "walk away" from the Democratic Party. Planned for March 28, the town hall was spearheaded by "former liberal" Brandon Straka, a gay man who now claims the Democratic Party "[uses] lies, fear mongering, fake news, hate and division to keep us coming back." In a statement sent to The Advocate on Wednesday, The Center justified its decision to host the event. "The Center is a non-partisan 501(c)(3) organization," read the statement. "We do not support or endorse activities held by groups renting our space. All groups utilizing space at The Center must execute a Space Use Agreement and agree to our Space Use Terms and Conditions, Code of Conduct and Pledge of Non-Discrimination. We acknowledge the diversity of our community's perspectives, and while we may be disgusted by or reject the ideas some groups espouse, we will not stand in the way of their right to say them. Our responsibility is to provide space for connecting and organizing across our diverse viewpoints, not to censor." Following threats of a protest, organized by ACT UP New York member Jason Rosenberg, The Center reversed course. "Upon further review and consideration, The Center has cancelled the March 28 Walk Away event," read the Friday announcement. "We strongly oppose censorship and fully stand by our commitment to free speech, but as our space use policy states, we reserve the right to cancel any event that promotes discriminatory speech or bigotry; negatively impacts other groups or individuals that use The Center; or conflicts with, or interferes with, Center-sponsored or produced programming. It has become clear that this event would violate all of these important policies. The Center is committed to a comprehensive, transparent review of the processes that led to this booking, and how we can further improve our space use procedures and decision-making. We understand that the work to heal and rebuild trust begins today." Panelists attached to the now-canceled town hall included transgender YouTuber Blaire White, political commentator Rob Smith, and writer Mike Harlow. White may have been the most controversial figure — she regularly mocks nonbinary and gender-nonconforming people, and published a video titled, "Fat Acceptance is Stupid." As reported by Out, Smith is a black gay conservative, who claims he faced less discrimination for his sexual orientation than for his political leanings. Straka, meanwhile, says #WalkAway is a grassroots mission against the "divisive tenets endorsed and mandated by the Democratic Party of today." In a video on the #WalkAway website, Straka says liberals and Democrats have cruelly turned against white, straight men.